Yesterday I made a few comments in Twitter that prompted a fair amount of questions and requests for more information. The quips I made were about the differences between Web 2.0 (yes, an ambiguous term) and Enterprise 2.0 (equally ambiguous term both for the definition of enterprise and the 2.0 bit). My comments were in response to Bruce Stewart's comment The whole "Enterprise 2.0" schtick is wearing thin, unless you've been monitoring real results. Otherwise you're just pumping technology.. In part I agree, but I am really seeing things still are really early in the emergence cycle and there is still much need for understanding of the social tools and the need for them, as well as how they fit in. There are many that are selling the tools as technologies with great promise. We have seen the magic pill continually pitched and bought through out the history of business tools. (For those new to the game or only been paying attention for the last 15 years, a huge hint, THERE IS NO MAGIC PILL). One comment I made yesterday is, "the difference between Web 2.0 and Enterprise 2.0 is like the difference building a tunnel through rock and tunnel under water". That this is getting at is Web 2.0 takes work to build to get through the earth, but once built it can suffer from imperfections and still work well. The tunnel can crack and crumble a little, but still get used with diminished capacity. We can look at Facebook, which has a rather poor interface and still gets used. Twitter is another example of a Web 2.0 solution that has its structural deficiencies and outages, but it still used as well as still loved (their Fail Whale is on a t-shirt now and a badge of pride worn by loyal users). The Enterprise 2.0 tunnel is built under water. This takes more engineering understanding, but it also requires more fault testing and assurances. A crack or crumbling of a tool inside an organization is not seen kindly and raises doubts around the viability of the tool. The shear volume of users inside an organization using these tools is orders of magnitude less than in the open consumer web world, but faults are more deadly. The other important factor is perceived fear of the environment. Fewer people (by pure numbers - as the percentages are likely the same, more on this later) are fearful of tunnels through land, they may not have full faith in them, but they know that they will likely make it safely on all of their journeys. The tunnels under water have greater fears as one little crack can cause flooding and drowning quickly. Fears of use of social tools inside an organization is often quite similar, there may be many that are not fearful, but if you spend time talking to people in organizations not using tools (it is the majority at this point) they are fearful of open sharing as that could lead to trouble. People are not comfortable with the concept as they are foreign to it as they are lacking the conceptual models to let them think through it. Another statement yesterday that garnered a lot of feedback was, "Web 2.0 does not work well in enterprise, but the approaches and understandings of Web 2.0 modified for enterprise work really well." The web is not enterprise or smaller organizations for that matter. The open consumer web has different scale and needs than inside organizations and through their firewalls. A small percentage of people using the web can get an account on a tool have have appear to be wildly successful correctly claiming 70 million or 100 million people are or have used their tool. But, even 100 million people is a small percentage of people using the web. Looking at real usage and needs for those tools the numbers are really smaller. Most darlings of the Web 2.0 phase have fewer than 10 million users, which is about 5% of the open consumer web users in the United States. On the web a start-up is seen as successful with 500,000 users after a year or two and is likely to have the capability to be self sufficient at that level too. Granted there are many players in the same market niches on the web and the overall usage for link sharing and recommending for Digg, Mixx, or Reddit is much higher across the sum of these tools than in just one of these tools (obviously). These percentages of adoption and use inside organizations can make executives nervous that their money is not reaching as many employees as they wish. The percentages that can be similar to the web's percentages of high single digit adoption rates to the teens is seen as something that really needs more thinking and consideration. 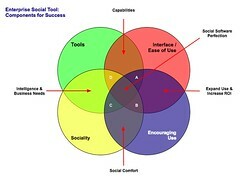 Enterprise 2.0 is more than just tools (see my Enterprise Social Tools: Components for Success for better understanding) as it also includes interface/interaction design for ease of use, sociality, and encouragement of use. The two biggest factors that are needed inside an organization that can receive less attention on the web are the sociality and encouragement of use. Understanding sociality is incredibly important inside an organization as people are used to working in groups (often vertical in their hierarchy) that have been dictated to them for use. When the walls are broken down and people are self-finding others with similar interests and working horizontally and diagonally connecting and sharing with others and consuming the collective flows of information their comfortable walls of understanding are gone. A presentation in Copenhagen at Reboot on Freely Seeping Through the Walls of the Garden focussed just on this issue. This fear inside the enterprise is real. Much of the fear is driven by lacking conceptual models and understanding the value they will derive from using the tools and services. People need to know who the other people are that they are sharing with and what their motivations are (to some degree) before they have comfort in sharing themselves. Encouraging use is also central to increased adoption inside organizations. Many organizations initial believe that Web 2.0 tools will take off and have great adoption inside an organization. But, this is not a "build it and they will come" scenario, even for the younger workers who are believed to love these tools and services and will not stay in a company that does not have them. The reality is the tools need selling their use, value derived from them, the conceptual models around what they do, and easing fears. Adoption rates grow far beyond the teen percentages in organizations that take time guiding people about the use of the tools and services. Those organizations that take the opportunity to continually sell the value and use for these tools they have in place get much higher adoption and continued engagement with the tools than those who do nothing and see what happens. The last related statement was around the gaps in current and traditional enterprise tools. At the fantastic Jive Enterprise UI Summit in Aspen a few weeks ago there was a lot of discussion about enterprise tools, their UI, and ease of use for employees by the incredible collection of people at the event. One of the things that was shown was a killer path of use through a wide encompassing enterprise toolset that was well designed and presented by SAP's Dan Rosenberg who has done an incredible job of putting user experience and thinking through the needed workflows and uses of enterprise tools at the forefront of enterprise software planning. Given the excellent design and incredible amount of user experience thought that went into the tools behind the SAP toolset in the scenario (one of the best I have seen - functioning or blue sky demoed) there are still gaps. Part of this is identifying of gaps comes from traditional business thinking around formal processes and the tools ensure process adherence. But, the reality is the tools are quite often inflexible (I am not talking about SAP tools, but traditional enterprise tools in general), the cost of time and effort is beyond the gain for individuals to document and annotate all decisions and steps along the way. The hurdles to capture information and share it are often too large for capturing one to 10 quick sentences of information that can be retained for one's own benefit or shared with other where it is relevant. There is another gap in business around the collective intelligence that is needed, which can lead to collaboration. Most businesses and their tools focus on collaboration and set groups, but at the same time wonder why they do not know what their company knows and knowledge is not all being captured. First there is a difference between collective and collaborative activities and the tools and design around and for those different activities is more than a nuance of semantics it is a huge barrier to capturing, sharing, and learning from information that leads to knowledge if it is not understood well. Enterprise has gone through its phases of knowledge management tools, from forms for capturing information, forums for sharing, and up to enterprise content management systems (ECM) that encompass document management, content management, knowledge management, and information harvesting. But, the gaps still exist. These existing gaps are around conversations not being captured (the walls of the halls have no memory (well today they do not)) and increasingly the ubiquitous communication channel in organizations, e-mail, is being worked around. Quick decisions are not being documented as it is not enough for a document or worth completing a form. As the iterative processes of development, design, and solution engineering are happening at quicker and smaller increments the intelligence behind the decisions is not being captured or shared. This is largely because of the tools. As has always been the case large enterprise systems are worked around through the use of smaller and more nimble solutions that augment the existing tools. Even in Dan's incredible demo I saw gaps for these tools. The quick tools that can fill these gaps are blogs, wikis, social bookmarking, tagging, Twitter type sharing, Veodia type video sharing, instant messaging, etc. There are many avenues to quickly capture information and understanding and share it. These tools get out of the way and allow what is in someone's head to get digitized and later structured by the individual themselves or other people whom have had the information shared with them in a community space. This turns into flows through streams that can be put into many contexts and needs as well as reused as needed. Another point Dan stated at the Enterprise UI Summit that is dead on, is organizations are moving out of the vertical structures and moving to the horizontal. This is having a profound effect on the next generation of business tools and processes. This is also an area for Enterprise 2.0 tools as they easily open up the horizontal and diagonal prospects and tie into it the capability for easily understanding who these newly found people are in an organization through looking at their profiles, which eases their fears around sharing and unfamiliar environments as well as their related tasks. The announcement yesterday of Delta and Northwest airlines merging triggered a couple thoughts. One of the thoughts was sadness as I love the unusually wonderful customer service I get with Northwest, and loathe the now expected poor and often nasty treatment by Delta staff. Northwest does not have all the perks of in seat entertainment, but I will go with great customer service and bags that once in nearly 50 flights did not arrive with me. Stewart Mader brought this to mind again in his post Onboarding: getting your new employees cleared for takeoff, which focusses on using wikis (he works for Atlassian and has been a strong proponent of wikis for years and has a great book on Wiki Patterns) as a means to share and update the information that is needed for transitions and the joining of two organizations. I really like his write-up and have been pushing the social tools approach for a few years. The wiki is one means of gathering and sharing information. It is a good match with social bookmarking, which allows organizations that are coming together have their people find and tag things in their own context and perspective. This provides finding common objects that exist, but also sharing and learning what things are called from the different perspectives. Communication is a key cornerstone to any organization working with, merging with, or becoming a part of another. Communication needs common ground and social bookmarking that allows for all context and perspectives to be captured is essential to making this a success. This is something I have presented on and provided advice in the past and really think and have seen that social tools are essentials in these times of transition. It is really rewarding when I see this working as I have been through organization mergers, going public, and major transitions in the days before these tools existed. I can not imaging thinking of transitioning with out these tools and service today. I have talked to many organizations after the fact that wished they had social bookmarking, blogs, and wikis to find and annotate items, provide the means to get messages out efficiently (e-mail is becoming a poor means of sharing valuable information), and working toward common understanding. One large pain point in mergers and other transitions is the cultural change that brings new terms, new processes, new workflow, and disruption to patterns of understanding that became natural to the people in the organization. The ability to map what something was called and the way it was done to what it is now called and the new processes and flows is essential to success. This is exactly what the social tools provide. Social bookmarking is great for capturing terms, context, and perspectives and providing the ability to refind these new items using prior understanding with low cognitive costs. Blogs help communicate people's understanding as they are going through the process as well as explain the way forward. Wikis help map these individual elements that have been collectively provided and pull them together in one central understanding (while still pointing out to the various individual contributions to hold on to that context) in a collaborative (working together with one common goal) environment. Another attribute of the social tools is the speed and cost at which the information is shared, identified, and aggregated. In the past the large consulting firms and the slow and expensive models for working were have been the common way forward for these times of change. Seeing social tools along with a few smart and nimble experts on solid deployments and social engagement will see similar results in days and a handful of weeks compared to many weeks and months of expensive change management plodding. The key is the people in the organizations know their concerns and needs, while providing them the tools to map their understanding and finding information and objects empowers the individuals while giving them knowledge and the means to share with others. This also helps the individuals grasp that are essential to the success and speed to the change. Most people resent being pushed and prodded into change and new environments, giving them the tools to understand and guide their own change management is incredibly helpful. This decreases the time for transition (for processes and emotionally) while also keeping the costs lower. This weblog now has a new domain attached, www.personalinfocloud.com. You may want to adjust your links and aggregation to update this change. Things will look a little funny at the old address. We made this change to be more future ready. We have had the domain for quite some time, but have not tied it to this weblog until now. The Personal InfoCloud is only a piece of a much larger project that will be rolled out over time. The first step (well the first step that you can see today) is to get the Personal InfoCloud set. Now that the domain is tied to the site we will be posting here again more regularly. The links should not change, no matter where this site lives in the future or what it looks like. This site will always focus on the Personal InfoCloud matters, as broad and as narrow as they are. One of the items that will be covered here will be folksonomy as it has a role in the Personal InfoCloud with people tagging information for their own retrieval using their own vocabulary. Welcome to the Personal Information Cloud. In the digital realm we have various pockets of information all tied to clouds. The most commonly understood cloud is the Global Information Cloud, i.e. the Internet. There is a plethora of information in this Info Cloud, but often there is too much information and the users are flooded with information choices and most often can not control all the information is or could be useful to them. Often the focus with content creators and Information Architects is with getting the user and the information together. This attraction interaction between user and information is often were content creators stop. There is little heed given to how the user will consume and often reuse that information.